In a certain family each daughter has the same number of brothers and sisters. Each son has twice as many sisters as brothers. How many sons and daughters are there in the family? This is obviously a very straightforward problem in algebra. Let G be the number of girls in the family and B be the number of boys. Each girl has G-1 sisters and B brothers. Each boy has G sisters and B-1 brothers. Now let’s add 1 to each side again. Now let’s subtract G from each side. Finally, let’s subtract 2 from each side. …which implies that B = -3. So this particular family has negative two daughters and negative three sons. which has infinitely many solutions for G and B. So where’s the error? So the family is made of ordinary matter after all. Corporations are not people, yet as “juristic persons” they enjoy many of the same protections that our government “of the people, by the people, for the people” grants to people. At the same time, they suffer fewer of the penalties. How do you incarcerate a transgressing corporation? Why are people subject to capital punishment and corporations aren’t? It’s hard to pick the greatest threat to the American idea right now, but the lopsided power of amoral corporations is certainly on the short list. They profiteer from war, they mute our public discourse, they produce unhealthful things in unhealthful ways and then use corporate Jedi mind tricks to get us to buy them. People have a time horizon of a generation or two: they want to leave a better world to their children and grandchildren and are willing to sacrifice in the short term to make sure of it. But even conscientious corporations are required to focus only on the next few fiscal quarters. Taking a longer view — not maximizing profits right now — risks a shareholder lawsuit. On the other hand, there has never been a greater engine of prosperity in human history than the modern corporation. It’s easy to demonize corporations for the evils they cause — but it wouldn’t be so easy without the comforts they also provide. Here is why John Edwards is my choice for president: he alone is dedicated to standing up to the power of big corporations. He alone has the paper trail to prove it’s not just campaign bluster. He alone has announced a plan to make corporations play fair. Yet he’s a corporate player himself — not a frothing, dogmatic anti-capitalist — who understands their underlying value. No, taking little Jane and Michael to the bank was the result of some psychological jujitsu by Mary Poppins, who seemed somehow to know precisely the trouble that would ensue — and how it would ultimately heal the Banks household. Jane and Michael’s introduction to Mr. Dawes, the bank’s senior partner, goes disastrously. Michael refuses to let Mr. Dawes see the twopence he’s brought, which farcically precipitates a run on the bank. “Stop all payments! Stop all payments!” shouts a harried bank officer. Clerks scoop up cash and coins and hightail it to the vault. Word spreads fast and a mob throngs in from the street outside. You’re a man of high position, esteemed by your peers. And when your little tykes are cryin’ you haven’t time to dry their tears and see them grateful little faces smilin’ up at you because their dad, he always knows just what to do. I watched this recently with my three-and-a-half-year-old son Archer, who is extremely chatty when watching movies. He continually asks for commentary on the action in the film, even when it’s extremely obvious and he understands it perfectly well. (“Why did Robin climb down that ladder?” “To hand Batman the can of Shark Repellent Bat-Spray.” “Why?” “To make the shark stop biting Batman’s leg.” “Why?” “Because would you like a shark biting your leg?” “No.” “That’s why.”) We encourage this, because it turns what would be a very passive, brainless activity into an interactive, enriching one. To cap it all off, Banks’ children shuffle contritely into the room, offer a sweetly sincere apology, and place in his hands the troublesome twopence. Wonder, sorrow, admiration — it’s as if he’s seeing his children for the first time, and it’s all right there on his face. And could that be a glimmer of a new lightness in his heart? Some emotional moments are too profound for words. Archer seemed to sense this too and remained uncharacteristically silent for the next several minutes as George Banks grappled with a rearrangement of his worldview. For all the music and color and whimsy in this film, this one little moment was its dramatic climax. It was the perfect use of a reaction closeup. I am no Bette Davis fan. But she delivers an amazing performance in Frank Capra’s final film, Pocketful of Miracles, and does much of it with her amazing, aging face. In the film, she’s Apple Annie, a gin-swilling panhandler on Depression-era Broadway. She’s a tough old broad but she has a secret soft spot: she adores her daughter Louise, who has lived abroad all her life and knows nothing of her mother’s true nature. Annie has maintained a deception in her lifelong correspondence with Louise, claiming to belong to New York’s high society. Now Louise, grown into a beautiful young woman, writes that she is engaged to marry a Spanish nobleman — and they are coming to New York to receive her blessing! Annie wanders the city in a daze. What can she do? She longs to meet her daughter and hold her in her arms, but she is ashamed of herself, afraid of what Louise will think, and fearful of causing Louise’s fiancé to break the engagement. Fortunately, an important local gangster (with a heart of gold), Dave the Dude, has his own soft spot — for Annie. He believes that her apples bring him luck, and he never does business without first buying one from her. Now he’s due at his most important meeting yet, with a major mob boss from Chicago. But Annie is nowhere to be found. Annie’s fellow panhandlers (who have known about Louise all along and have learned about Annie’s dilemma) find Dave and bring him to Annie’s pathetic little tenement, where she is out of her mind with worry, and drunk to boot. They tell Dave about Annie’s daughter and plead with him to help her. Dave interrogates Annie skeptically, all impatience. He just wants to buy an apple and get to his big meeting. He doesn’t have time for this. Annie just overdid it on the gin again, that’s all. As Dave the Dude rails insensitively against the story the panhandlers tell him and what they’re asking him to do, the camera is tight on Annie’s miserable, besotted face. The shame, fear, and desperation in that face build to a piteous crescendo, more vivid than any mere dialogue could have made it. She doesn’t want Dave to see her like this, she doesn’t want him to know her secret pain, and his brusque manner isn’t making anything easier. When he finally spots a photo of Louise and demands, “Is this your kid?” Annie denies it. An instant later her heart breaks as he tosses the picture frame aside — and the truth is out. The cops are closing in on Ned Racine, and he knows it. Worse: the cops are his friends. From them he learns that a crucial piece of evidence in a murder case is the victim’s missing eyeglasses. If they can be found, it should clinch the case — and put Ned in jail, because he’s guilty of the crime. In Lawrence Kasdan’s noir homage Body Heat, a masterpiece in its own right, Ned has conspired with his mistress, Matty Walker, to kill her rich and distinctly unlikeable husband. Ned, a crummy defense attorney, learns from one of his recidivist clients, Teddy, how to create an incendiary device with a timer. With it, Ned obliterates much of the evidence (including the dead body). Now his client warns him that a tall, beautiful brunette came around asking him how to rig such a device to a door. Ned is stunned. Could that have been Matty? Who else would have known to ask Teddy about such a thing? Why would she need another bomb? Why wouldn’t she tell Ned? Then Ned gets a call from Matty, who’s out of town. I know where the glasses are, she tells him. The housekeeper was blackmailing me with them. I paid her off. She put them in a drawer in my boathouse. You should go and get them right away. As Ned listens to Matty’s lies, the camera closes slowly on his face. His cigarette burns forgotten almost down to his fingers. He grunts his monosyllabic responses, but his face says everything that really matters. She wants me dead. She wants all the money for herself. She wants no witnesses. I’ve been a fool. 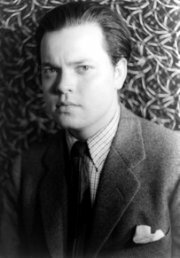 Recently I came across this photo online of a young Orson Welles and immediately saw (a broodier, better-dressed version of) myself. No, I just saw a striking physical resemblance. At once I mailed this photo to family and friends. “Don’t you think this looks like me?” I wrote. Everyone thought I was crazy. No one thought it looked remotely like me. It just goes to show you. I’m not sure what it goes to show you, but it does go to show you something. We didn’t go to see the Blue Angels on Saturday as originally planned. Too much else to do around the house, and Archer and I were both still recovering from being sick earlier in the week. Going into the city to see the Blue Angels is a major production, between the parking hassles and the crowds. We just weren’t up to it. Plus we were in the middle of a major reorganization of the house, with the kids graduating from toddler beds to bunk beds! On Sunday, the last day of Fleet Week, we planned to skip the Blue Angels again for the same reasons. But we ate lunch out, and after we finished and emerged into the sunshine, we marveled (knowingly) at the gorgeous weather and decided on the spur of the moment to try to catch what glimpses we could of the air show. It was already 2:15 and the show was probably already in progress. We knew we had no hope of parking anywhere, but we could at least drive back and forth over the Golden Gate Bridge and see a little bit of the performance from that vantage point. And that’s exactly what we did. Here and there we got brief, distant looks at close-formation flying over San Francisco Bay, heart-stopping dives toward the water, and multi-colored smoke-trail designs. Even at a distance, and even without the spine-rattling flyby engine roar, it was cool, if a bit of a letdown. We promised ourselves not to miss them again next year. For the next fifteen minutes we drove back up 101 to go home. Jonah dozed. We got off the freeway, navigated the usual maze of local streets, and rode up the middle of the little valley where our house sits. Surrounded by hills on three sides, a lot of the sky is blocked from view. And yet! We parked the car in the driveway, shook Jonah awake, gathered lunch leftovers and other items from the car, closed the doors, and stumbled lazily up our front steps, when we abruptly heard a growing, almighty roar. 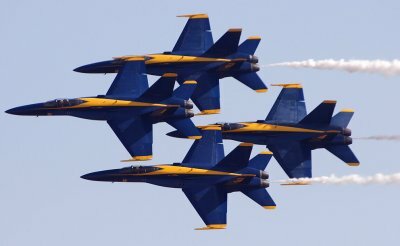 We all looked up, and an instant later were treated to the dazzling spectacle of all six Blue Angels appearing over the hill to our west! They screamed directly overhead in a tight delta formation, disappearing a moment later behind the hills to the east. They followed us home! The uncanny timing and positioning of the flyby can mean only one thing: the Navy knows I’m onto them. You know what was in yesterday’s weather forecast? Rain. You know what actually happened? It was a gorgeous day. In fact I had three people separately comment to me on the gloriousness of the weather yesterday, which is a couple of standard deviations from the usual number of people who make such comments to me on any particular glorious day. It’s would have been surprising — if I didn’t already know the score. You see, it’s Fleet Week again.